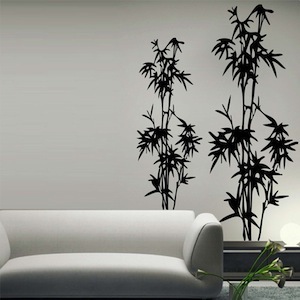 Make your inside wall feel like an outdoor paradise with the Bamboo Tree Wall Decal! 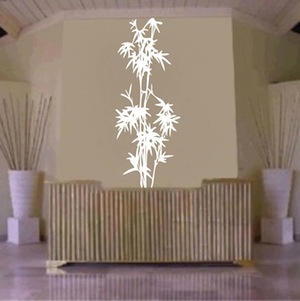 Why waste time, money, and energy with painting when the Bamboo Tree Wall Decal have saved you all of that trouble? Designs have many options for orientation that give you the flexibility to change and reposition to your taste if necessary. Try to get a painter to do that! Order includes one bamboo decal. Please note: The plain, black and white image below the product image is the actual design you will receive with each order in the size of your choice. Specify the desired orientation when applicable. Design sizes are within a close approximation. This is a lovely decal. I purchased in white and the 36"x14" size. I wish I had gotten the large size. It's so nice, I would have wanted it from the baseboard up. Nevertheless, it's exactly what is depicted on line. Such a tropical effect. I received this decal very quickly after I ordered it. I needed something to fill the space between my bed and door. A picture would have stuck out a bit from the wall and I would have to be careful that I didn't bump and knock it off the wall. This decal is perfect! I got white since my walls are dark chocolate brown and it really pops! I installed it myself in about 15 minutes. So easy to do. I will be ordering more decals for my bath and kitchen. Love the look and if I see something else, I can remove it and put up something new! Love these decals! Have now bought three of these Bamboo Tree decals in several sizes and probably going for a fourth. I've clustered them in the front (relatively dark) hallway near a sidelight window that has bamboo leaves etched on it. Caution with the taller ones: position and tape carefully because of the unwieldy size. Get another set of hands if you need to. I used this decal on my clear glass door to my pantry. It was easy to apply and it is really attractive and no one notices that my pantry is messy! Success!